Iraqi forces announced Fallujah to be "fully liberated" on Sunday, with Prime Minister Haider al-Abadi proclaiming last week that Fallujah had "returned to the embrace of the nation." The U.N. estimates that 85,000 people have fled Fallujah in the past month due to the fighting. Many have walked hours through desert heat to reach camps. The camps, however, cannot handle the number of displaced. Countless people remain unprotected against the heat, dust and sun. The need for more tents, water and food is critical. Fighting continues to escalate, and thousands more desperate civilians have escaped the city. Many are facing nightmarish conditions and sleeping in the open desert awaiting aid. 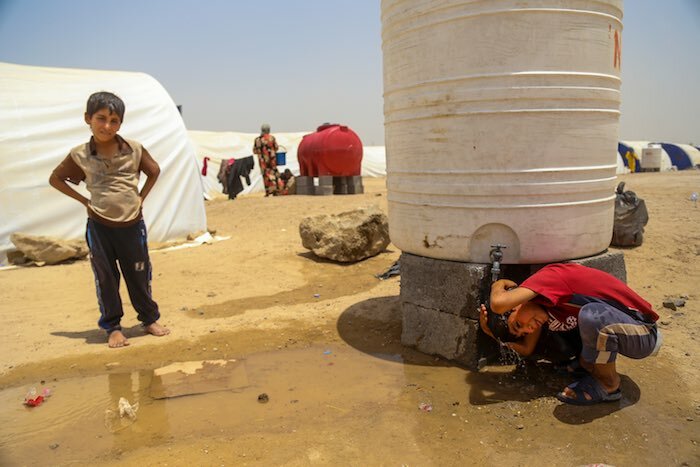 UNICEF is working urgently to provide safe water to families who have fled to the Ameriyat al Fallujah, Al Khalidiya and Al Habbaniya camps, installing three reverse osmosis units, each capable of producing 40,000 liters of fresh water per day. 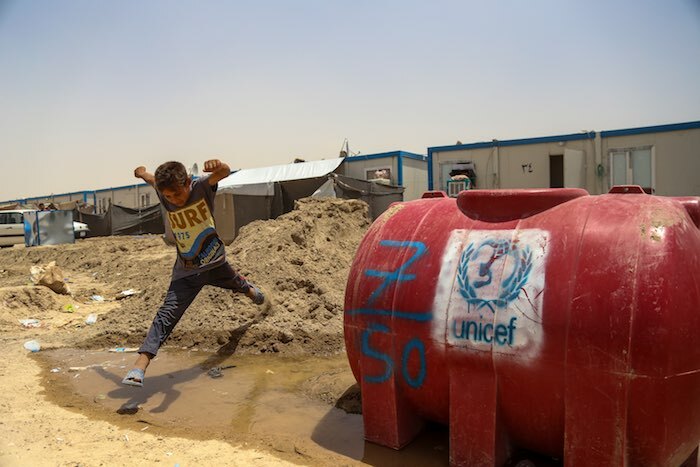 In all, UNICEF is installing 15 of these units across Anbar province to meet the growing needs of displaced children and families as summer heat intensifies. It's a race against time to provide lifesaving assistance to families fleeing escalating violence in Anbar. On June 5, UNICEF and three other U.N. partners (WFP, WHO and IOM) travelled to a series of camps receiving people escaping the violence in Fallujah. In the past ten days, approximately 10,000 people have come to these camps while an estimated 50,000 people remain trapped in the city as the military offensive continues. The Iraqi Government had established camps for the 60,000 people already displaced in Fallujah's Anbar province. These facilities are overstretched. As the battle for Fallujah intensifies, photos of families and children fleeing the fighting have been spreading across social media. The joint mission found people sheltering in tents or huddled in whatever shade they could find to escape the searing heat and blowing dust. Most people fled with just their clothes. One woman approached the mission team members and asked for help, saying: “We came with nothing, we have nothing." The U.N. and partners are spearheading a joint rapid response to provide safe drinking water, food rations, health care access and more to the growing number of people displaced by the violence. “As the violence intensifies in Fallujah, children continue to be trapped in the city and its surroundings. UNICEF estimates that at least 20,000 children remain inside Fallujah, 60 kilometers west of Baghdad. According to reports, food and medicine are running out and clean water is in short supply. Since the start of the military operation in Fallujah, very few families were able to leave. Most of these families moved to two camps while others sought refuge with relatives and extended families. As the violence continues to escalate in Fallujah and across Iraq, we are concerned over the protection of children in the face of extreme violence. Children face the risk of forced recruitment into the fighting, strict procedures for security screening and separation from their families. Children who are forcibly recruited into the fighting see their lives and futures jeopardized as they are forced to carry and use arms, fighting an adults’ war. With more than 10 million people in need of humanitarian aid, including 3.4 million displaced from their homes, the crisis in Iraq has hit children hardest. 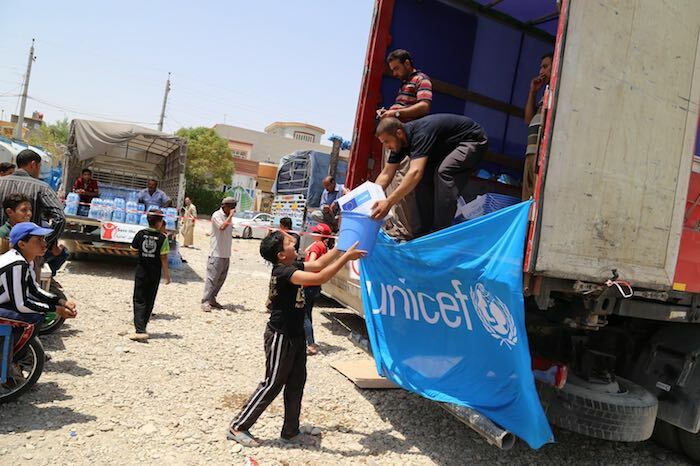 UNICEF has been working to meet the emergency needs of vulnerable families and children in dangerous situations — in Fallujah's Anbar province and across Iraq. 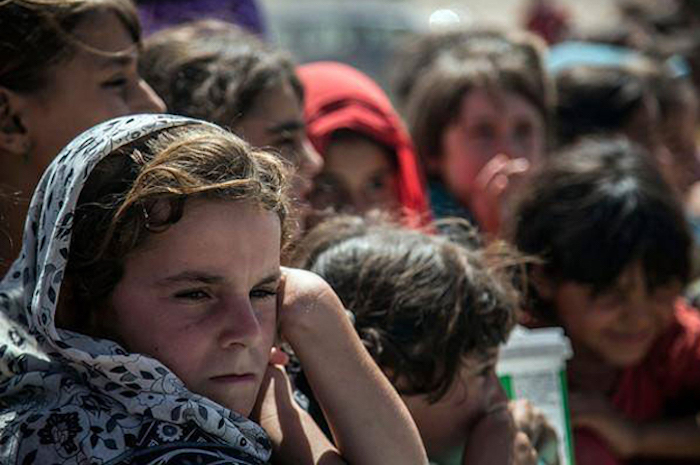 Civilians in Fallujah, Iraq, are at extreme risk and need urgent help. A displaced boy from Anbar province receives a Rapid Response Mechanism (RRM) kit during a distribution to 1,065 displaced families. Each kit contains emergency food, drinking water, soap and other hygiene items — with specific supplies for women and bables. Children displaced by ongoing violence recieved Rapid Response Mechanism kits (RRM) in their informal shelters in Anbar province. Displaced families living in critical shelter arrangements such as informal camps, unfinished buildings and school buildings benefited from UNICEF's RRM kits. Hayder, 5, from Salah al-Din province, is measured by health workers in a camp for displaced Iraqis in Baghdad. 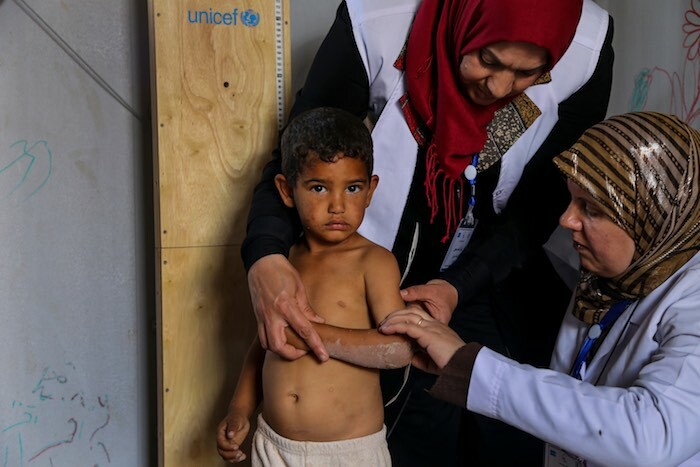 Hayder's household was one of 650 that UNICEF surveyed to gain information on food intake, health status and nutrition of displaced children in Iraq. A health worker administers polio vaccine to a child in Baghdad's Al-Takya Al-Kasnazaniya Camp. 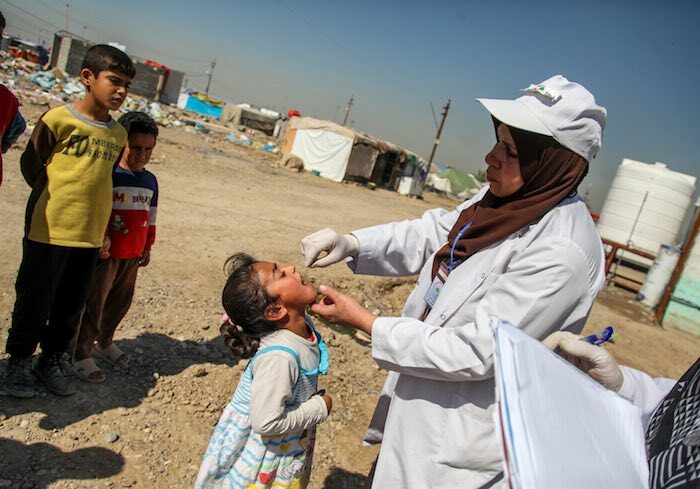 Some 5.8 million children under five are regularly vaccinated against polio in Iraq. 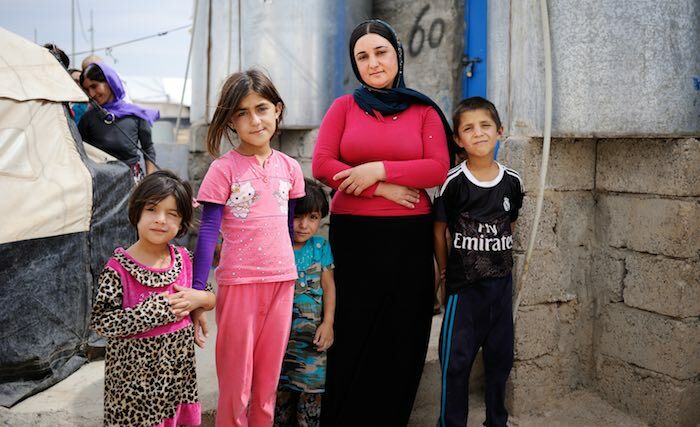 Besma and her children outside their tent in Bajet Kandala IDP Camp in northern Iraq. Her husband was beaten and taken away by militants after they escaped from their village on the Iraqi-Syian border. She now lives with her father and four children in Bajet Kandala. Besma received cash assistance from UNICEF in August 2015. 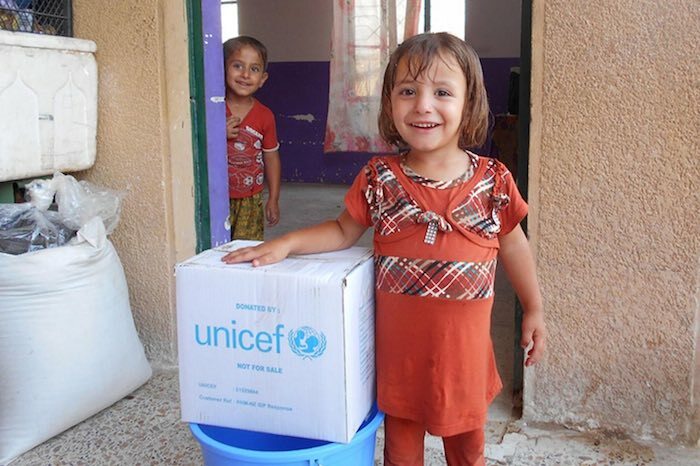 Please support UNICEF's relief efforts to help Iraqi children.